Here is the much awaited theme from our studio. We have been teasing about this release since the past year time and now we present you the first of its kind, unique "MusK- A Xenforo Style Premium MyBB Theme for MyBB 1.8x ". 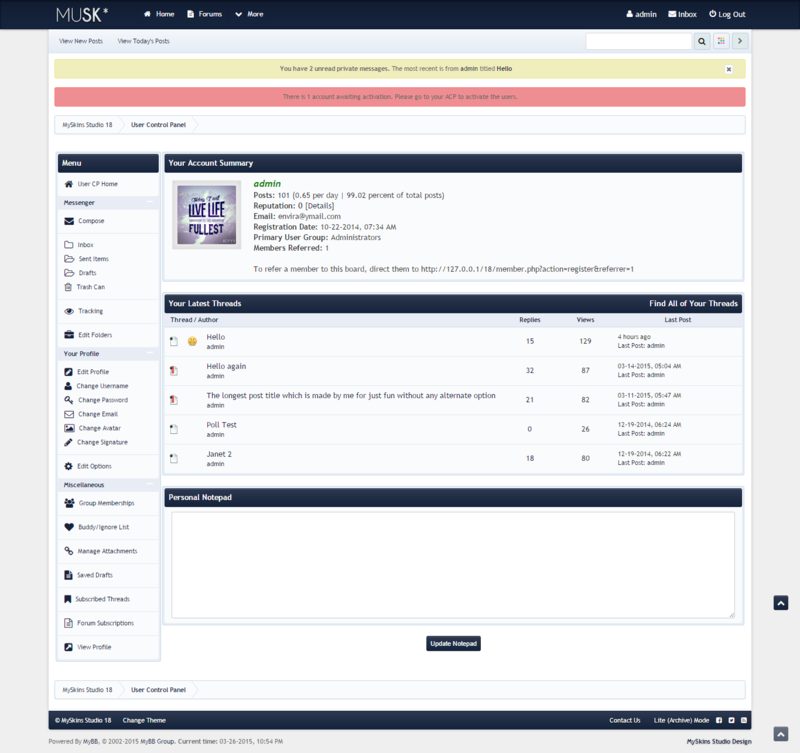 Actually if you remember, we planned it as a initial release for 1.6x series of MyBB, but due to time lapse we have barred its release, but now after working on the theme for hours long, days together we now present you this masterpiece. For those who love XF and Cant afford it this is just a loot to quench your thirst . First and the foremost are the features of the theme. Here is a list of features that features added in this theme. 1. 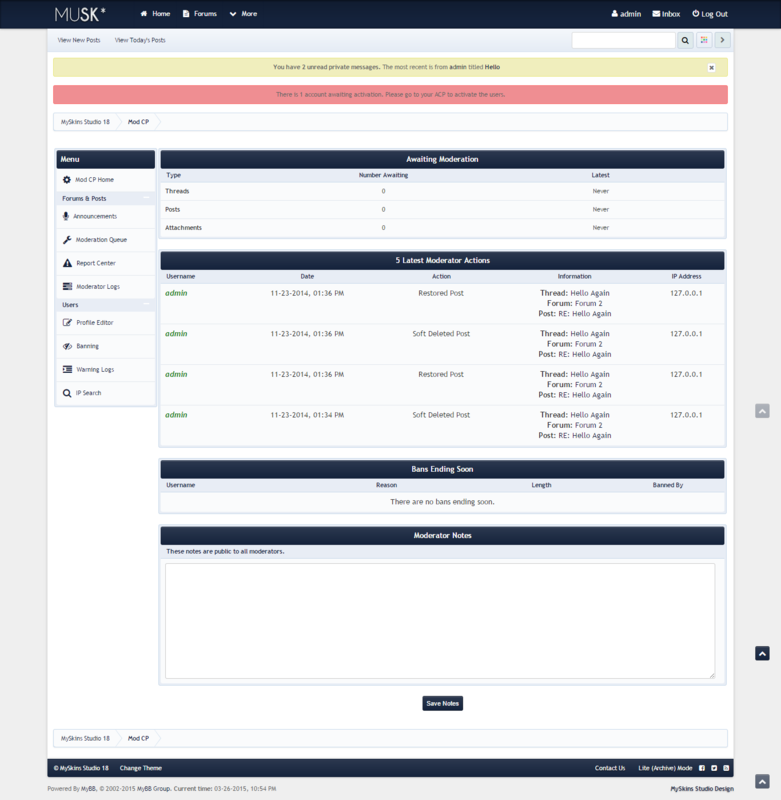 A complete Xenforo look alike theme, sleek, minimal, and the code is 100% MyBB and Original. 2. 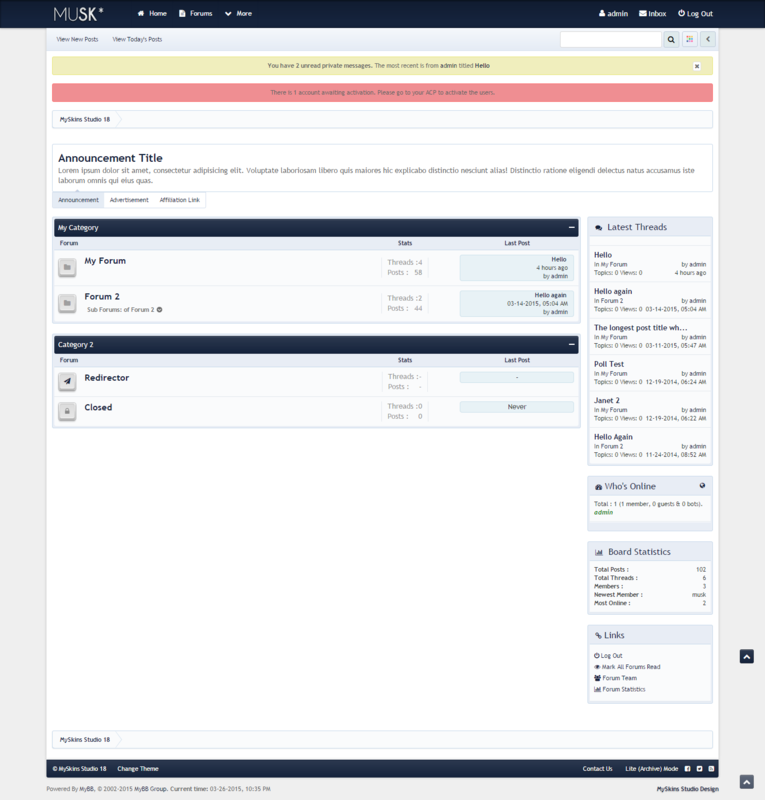 Xenforo Style Login Panel, Tabbed Profiles, Forumbit, show thread, Spinners etc. 3. Css3 and jQuery Main Menu and User Navigation. 4. Color Picker, with Unlimited Possibilities of Colors to Change and play, which changes Text, Links and Background Colors. 5. Css3 and jQuery Hover Effects like the Forum Description on Hover, Reflected Avatars etc. 6. Xenforo Style Moderation Options, Postbit. 7. Dropdown Subforums on Index. 8. Font Icons everywhere, like in User CP, Mod CP etc. 9. 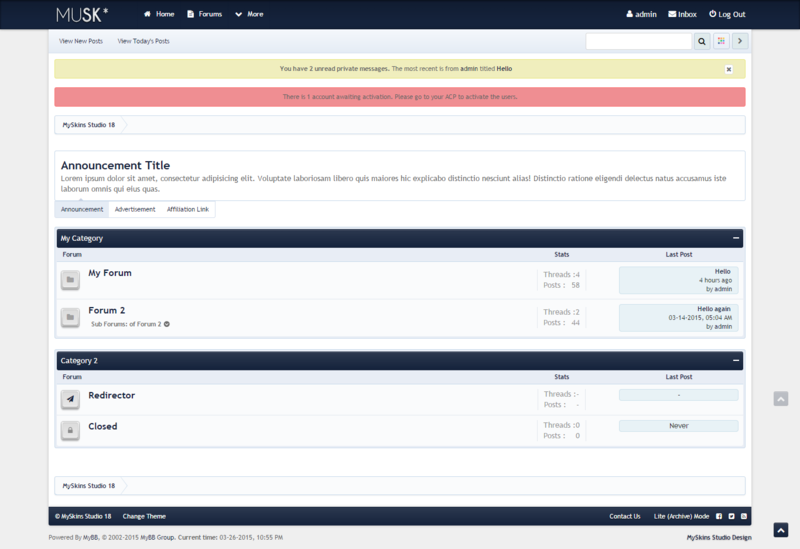 Sidebar with Custom Elements like Latest Posts, Statistics like Xenforo. 10. Xenforo Style Searchbox with Options. 11. Xenforo Style Tabbed Announcements on Index. 12. Custom Editor Skin that matches the theme. 12. Many more jQuery and Css3 Effects and animations. 13. Best quality Support and detailed Documentation of the theme. So let me give a detailed Previews with Images. I have made a Video Demo for you as quickly as possible and here is the link with explanation of all features. The theme is made available at only MySkins Studio Shop and User need to Login or Signup to make Purchase as the Users would be included in Subscriber/Customer category. They also enjoy the benefit of fast Support and answers to the questions. Method of Payment is only By Paypal. Note: Only Valid Purchases would get support. So we would recommend dear friends to get it from our Shop only. An Invoice is also included within the theme and every Purchase would get a mail from our Studio with Printed Invoice. Also i plan to donate some money from this theme sales to the people who lost so much during the recent "Hud- Hud Cyclone" that devastated my place.